Sassy tomboy Ginger Atkinson would rather be captaining a deep-sea fishing boat than baking pies, yet she still wishes she had a man to bake for. Sure, the pretty redhead is happy running her late father's Turtle Island ferry business, but everyone in the world is finding love except her. Stuck on the wrong side of thirty, she's trying to accept singlehood by building a dream home-for one. In high school, Carter Ridley loved to sneak off with his good friend Ginger to watch the sun rise over the ocean. But after graduation, his path took a different route. One that, unlike Ginger's, did get him the spouse and house of his dreams. At least, until a scandal shattered everything. 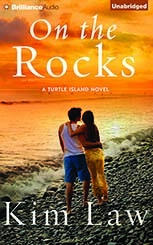 Running from his heartbreak, Carter returns to Turtle Island, where he discovers that Ginger is all grown up. His teenage friend has become the woman he's always wanted. But will Carter's pain scare him away from a chance at happiness? Or can he be the loving partner Ginger's been looking for?